Allows jigs and fixtures to slide in almost any direction. Slide your jigs and fixtures in almost any direction! They work as advertised. A great set up for the assembly table that I built. 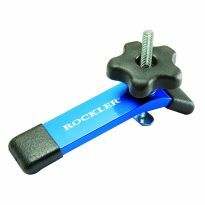 Rockler has great products. In an effort to save some money I ordered what looked like a creative alternative from Amazon. There are lots of companies selling what looks the exact same product. So I picked one. It took over a month to get here from China and it didn't work. It was the wrong size. I tried to return it and Amazon sorta said I could do it if the Chinese agreed. Never mind. So I did what I should have done in the first place. I bought 4 sets from Rockler. They are perfect. Beautifully finished. They went in like a dream. 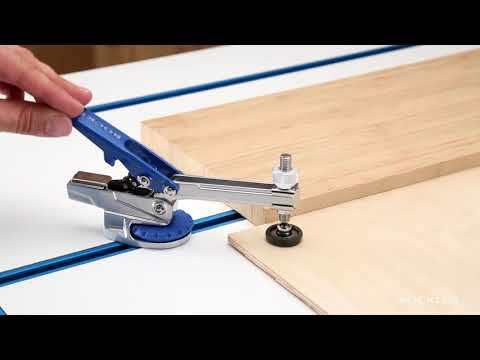 This is an excellent compliment to the Rockler Universal track. The dimensions were spot on and it even came with the screws to hold it down. Great value. Really feel like this are machined very well and designed precisely. I suggest #6 wood screws. I added a few of these to my workbench which really took clamping to the next level. 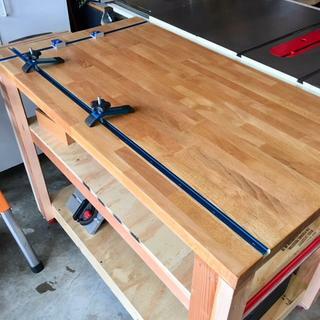 It really made locking work pieced into the center of the table easy without bar clamps getting in the way. I just built a drill press table (with the Rockler Fence) using Rockler T-Track and these Intersection kits. The table came out really great and the intersection kit gives me hold-down control from several angles. I used 3 -36inch long by 11 3/4 inch wide maple shelves cutting the ends of two outsides square and the center down to 6 inches wide. I glues them together using 3/4 inch birch plywood as a backing- 1 1/4 inch screws to keep everything tight. 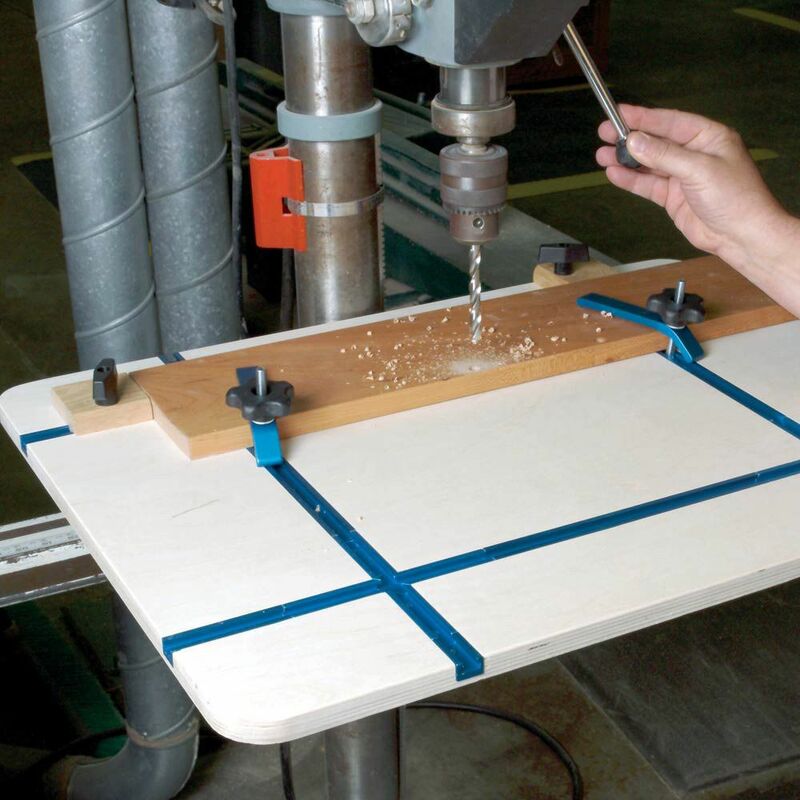 I have seen the tops you have available for routers, table saws and drill presses for years. 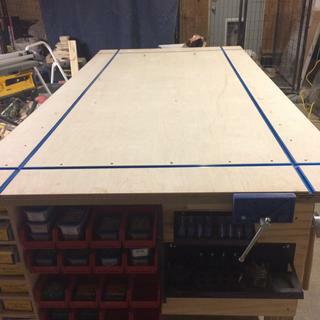 I decided to make one for my radial arm saw using your T track and T track intersection kits. The top is made of two pieces of 3/4&quot; MDF with 1/4&quot; deep slots cut in each piece to accomodate the T tracks. Everything went together well, the T tracks are 1/2&quot; below the top surface so the saw blades will not cut into them and it works quite well, so far. 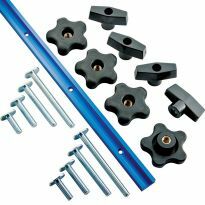 This T-Track Intersection Kit is very easy to install and makes it very easy to use and create intersections on your workbench. I think it's really great and it's way better than creating your own by cutting 45 degree angles on your straight t-track stock. The only negative aspect of them is the price. I have a 3X4 ft. bench with a 2" overhang on all sides, so I needed 9 (Nine) intersections for the whole bench which cost me almost $225.00. 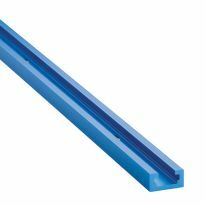 Plus I had to buy the rest of the track for the straights in between the intersections, costing me another $60.00 for two, four ft. lengths for a total of $285.00....just for T-Track. The Shop Stand legs and stretchers only cost me $160.00 and the 4X8, 3/4" (Doubled for 1-1/2" thickness) plywood for the top was $36.00 for a total of $190.00. And just the T-Track was $285.00. So to me, even though the T-Track is really a great product, and I really like it, I think it's WAYoverpriced, hence only 4 stars. I would only recommend it to people with a lot of money. I had fully expected it to be a one piece unit. But there are 4 parts to the intersection. I could not find a reason for it not to be one unit. The way it goes together makes it just a bit more likely that the user could leave a gap in the final build. It works great. I didn’t notice that it comes in 4 pieces instead of just one. It would be cheaper and just as effective to make your own if you have any spare t track laying around. It is what it is. 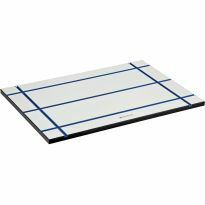 If your making a t track table, these make it very easy. You. Could make your own though. I haven't used it yet. but it looks like it's going to do the job in my next project. Excellent material & inst. Hard to match older track shapes. this comes in 4 parts it needs to be one hole part, I need to shim to level to t-track. Got the job done but way-way overpriced!!! some of them with screws I had on hand. I ordered this "intersection" so I could build a platform that was certain to be square. I was going to use the intersection as my base then attach more t-track to the ends of the intersection. I was shocked when it arrived in the mail to see that it was NOT assembled. It comes in four parts that you screw down independently to make the intersection. I wanted something that was already assured to be "square" on which to base my platform. Every image of this item is shown assembled and I never noticed in the description that it comes in four parts! Maybe Rockler should picture this unassembled. I apparently never have read the description because, after all, when you look at the photo, it seems very self-evident. What kind of questions come to mind? None for me! 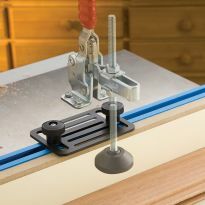 Love Rockler products! But this one threw me for a loop. 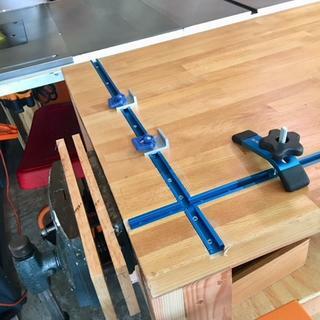 Needed to finish my router table setup. To build a table for my drill press. Looks to be an excellent quality part!! I didn't want to take the time to cut my own. That being said, $25.00 for one of these is just crazy and the shipping should only around $6.50. 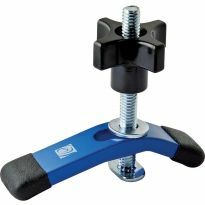 I've purchased items from Rockler a lot over the years but have never been this dissatisfied with item cost and shipping. I'm laying out a grid on my assembly table. this made it easier to do. 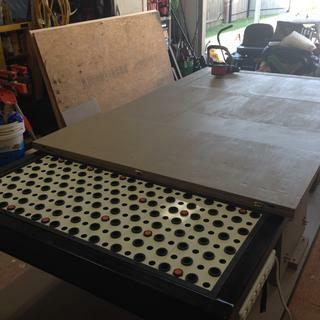 Making a drill press table. 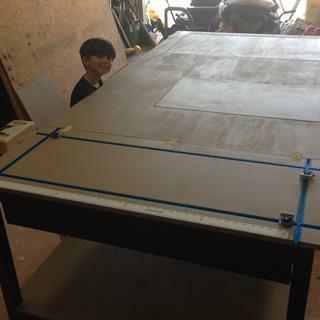 I am going to make a large layout table. need it for router table that i made. Is this the universal track for both 1/4" and 5/16" T bolts? BEST ANSWER: Yes for both T bolts, 1/4" Hex only. Is this compatible with universal t track? BEST ANSWER: I used the T-track intersection with the universal T track and it works great. The fit is not perfect but the function is. I bought it for a totally separate use. I am not sure. Sorry! Yes it is, mine works well. The description says "Each aluminum piece is 3" long and is cut at 90°".Actually one of the ends is cut to form an angled tip. Is the 3" measured from tip to tip or does it omit the spear-like tip? BEST ANSWER: 3" from point to flat, does it really matter? I calculated the number of intersections I wanted, then ordered (4) of the pieces that were 3" tip to tip per intersection. Then it was just filling in the runs with straight channel. To be clear - each 3" piece is angled cut for an intersection just like the picture, with the opposing enda 90 degree cut to accept butting a regular channel piece to it. Yes, it is 3" from the straight end to the tip. The T-Track Intersection kit I purchased clearly shows the height to be 1/2" and it definitely is incompatible with the universal T-Track which is 3/8" high. No where have I found the height mentioned. I have two packages which I cannot use because all the T-Track (12 - 3') are 3/8". I have had these for a while now but ordered all at one time. I hesitate to re-order because the specifications do not list the height which given my experience I have no idea whether anything I reorder will be 3/8". So Rockler, what do you suggest? BEST ANSWER: I bought 9 packs of the part no 22209. All are all 3/8 inch and matches the track which is 3/8 inch. I have no idea why yours do not match. Did you order the part number 22209? Hope this helps you. 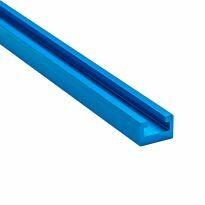 The Of the blue anodized Rockler T-track is 3/8”deep x 3/4”wide. I hope this helps . What is the thickness or height of the track? BEST ANSWER: Outside dimensions are 3/4 wide and 3/8 deep. Is the track compatible with 1/4 inch bolt ends? Can I put 1/4 inch bolt ends into the slots? Everbilt 1/4-20 nut purchased at Home Depot. There are two part numbers on the packet: 803461 in the pouch itself (which might be the Home Depot stocking number) and 330 064 in the upper right of the plastic pack (which might be the manufacturer's part number). I tried several other 1/4 inch nuts that were slightly too thick and also slightly too wide including stainless steel nuts but this nut by Everbilt fit perfectly. Yes the 1/4 inch hex bolts work very well for my jigs. Not all bolts are made the same though, choose wisely. How wide is the overall extrusion? BEST ANSWER: Each segment is 3/4 inch wide by 3 inches long. Each segment has a point with 45 degree angles so they all fit together into a cross. What are the dimensions of the mounting hole placements?